Many of you may be aware of the fact that Microsoft released Windows 10 today. Well I logged into the Microsoft Partner Portal earlier and downloaded the MAPS (Microsoft Action Pack) copy of the Enterprise edition. I then loaded it up in a virtual machine and had a quick play around with it. This article lists some of the new features and hopefully helps you decide whether to upgrade or not. Also check out our video below to see how Windows 10 looks and feels. Many of the folks who experienced the previous operating system, Windows 8, were very put off by the Start screen, which highlighted “metro-style” apps and live tiles. In Windows 10 Microsoft have brought back a more familiar style start menu in the lower left corner of the screen. The menu is a bit of a hybrid between the Windows 7 start menu and the Windows 8 app-driven start screen. It features live tiles and is highly customisable. If you love the start screen though don’t despair as Microsoft gives users the option of using the new start menu or the Windows 8 style start screen. Cortana is a bit like Siri, Apple’s voice-driven assistant. You can essentially talk to your computer to perform searches or access information on your computer. Unfortunately I tried to use Cortana but was met with a “feature not available in your region” error (I’m located in Australia). As this was the first day of release I was a bit disappointed but hopefully it will be available soon. Internet Explorer has been replaced with Edge. Edge is very minimalist compared to Internet Explorer – there are no toolbars, icons and settings to get in the way of viewing various web pages. I haven’t fully tested it but it seemed nice and fast. Users can also install their favourite browser though (eg Google Chrome, Firefox or even the “old” Internet Explorer). While I believe that Windows 10 will be successful for Microsoft, I would strongly advise you not to upgrade straight. I haven’t fully tested everything yet but this release may still have some bugs to work out which may cause issues on your computer. It may be better to wait a few months for these to be worked out. Make a complete backup of everything on your system. If something goes wrong during the upgrade process, you want to have a way to restore your computer to the way it was before the upgrade. The easiest way to do this is to use the built-in tools with Windows 7 or 8 to create a system image on an external hard drive. Install all of the latest updates on your operating system. It would be best to run Windows updates on your system prior to an upgrade to be sure that you have the latest security and system patches. Make sure that your current software and hardware is compatible with Windows 10. Everything may run just fine on your current system but it may not run smoothly on Window 10. Microsoft will release a compatibility tool which will inform you if your hardware and software will work with Windows 10. We recommend that you install the latest device drivers for your computer (particularly video and network devices) prior to upgrading. Be sure to back up your data. In addition to a full system upgrade, it would be wise to create a separate copy of your critical data (documents, pictures, music, videos, etc.) prior to upgrading. You should be doing this on a regular basis anyway. Upgrading your operating system is a daunting task for most users. If you are in Adelaide South Australia and feel that this is beyond your technical ability, we encourage you to give us a call. We will be offering a special Windows 10 upgrade service to our customers beginning in early August. Many of you may be aware of the fact that Microsoft will be releasing the latest version of their operating system later this month. There are some great new features in Windows 10, however you may want to wait, or at least be very careful, before you make the jump. This article discusses some things that you need to be aware of before you make the move. What’s Great About Windows 10? The return of the Start menu (well, sort of). Many of the folks who experienced the previous operating system, Windows 8, were very put off by the Start screen, which highlighted “metro-style” apps and live tiles. In Windows 10 Microsoft have brought back a more familiar style start menu in the lower left corner of the screen. It’s a bit of a hybrid between the Windows 7 start menu and the Windows 8 app-driven start screen. It is highly customisable and makes it easy to access most things you need on a daily basis. If you love the start screen though don’t despair as Microsoft gives users the option of using the new start menu or the Windows 8 style start screen. Cortana, Microsoft’s digital assistant. Cortana is a bit like Siri, Apple’s voice-driven assistant. In Windows 10, Cortana will be available on every device – phone, tablet, desktop and laptop. You can essentially talk to your computer to perform searches or access information on your computer. Cortana learns about you and will start to use what she knows to offer increasingly relevant information when you ask for it. For example, you will be able to ask/tell Cortana, “find me pictures from last month,” and she will present you with all pictures on your computer (or in OneDrive) from the past 30 days. Or you can say something like, “Is my flight going to leave on time today” and she will be able to give you a fairly accurate answer, based on current airline schedules. Microsoft Edge, the new web browser. A big change for users in Windows 10 will be that Internet Explorer will no longer be the default program to browse web pages on the Internet. Instead, Edge will be the new, streamlined browser experience. Edge will be very minimalist compared to Internet Explorer. There will be no toolbars, icons and settings to get in the way of viewing various web pages. However, Internet Explorer will still be installed in Windows 10 for users who must use it for compatibility reasons. Keep in mind, though, that you are free to install other web browsers, like Google Chrome or Firefox. Virtual desktops – Users will be able to set up multiple desktops on their Windows 10 computers. For example, you can set up a desktop with all of your work-related icons and a separate desktop for all of your personal items. Another use might be to set up a different desktop for each user in your home, rather than separate accounts for each user. Free upgrade for the first year. For users who are running Windows 7 (service pack 1) or Windows 8.1, Windows 10 will be available as a free upgrade for the first year after it is released. If you don’t upgrade within that year you will have to buy the operating system. 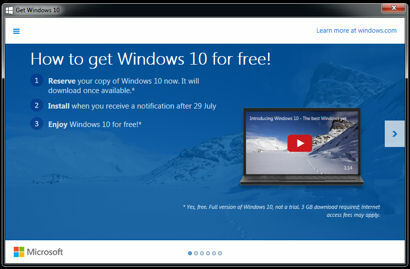 A few weeks back Microsoft began pushing out this offer for the free upgrade by installing an update on Windows 7 & 8 machines. You may have seen a small Windows flag in the lower-right hand corner of your screen encouraging you to sign up for the free upgrade. While I believe that Windows 10 will be successful for Microsoft, I would strongly advise you not to upgrade straight away once it is released. The initial release may still have some bugs to work out which may cause issues on your computer. It may be better to wait a few months for these to be worked out.